We’re proud to announce that the Gunpla Builders World Cup (GWBC) will be hosting its first ever competition in Montreal, Quebec at Otakuthon! 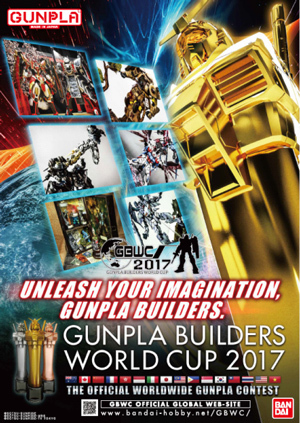 “Gunpla Builders World Cup” is the official Gunpla global tournament presented by BANDAI where modelers around the world show off their completed Gundam models. Previously, GBWC 2016 was held in 14 locations worldwide, but as of 2017, 3 new locations were added: France, Vietnam and now CANADA. 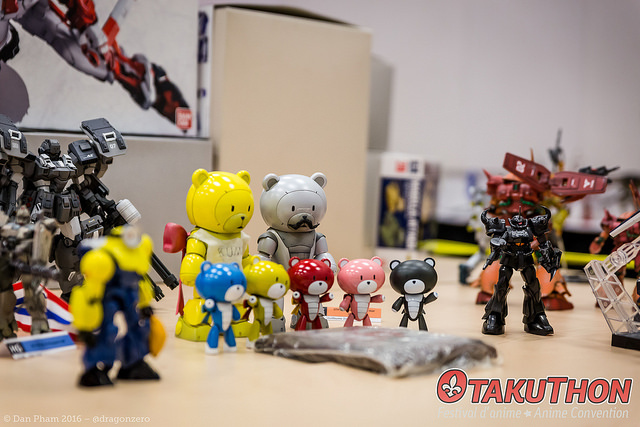 The competition intends to determine the greatest Gunpla builder in the world and let creators fight for the title of Gunpla World Cup Champion. - To be eligible to enter in the competition, the entrant must reside in the same country where the competition is held at the time of entry. - The Grand Finale will be held in Japan this December 2017. - Participants are required to have a valid travel visa to Japan in order to participate in the GBWC Grand Finals in Japan. Failure to do so will lead to disqualification. - The model must be created using plastic model original kits made by BANDAI. - The model must be made by the entrant. 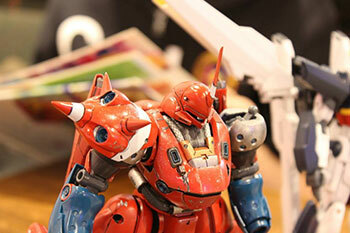 - Contestant who join GBWC acknowledge the rules and regulations of the contest. - The contestant's work, description, and other details which go against any contest rules and regulations will disqualified from the contest without any prior notice.Judges have the liberty to disqualify a participant on the spot if they see any discrepancies in the following of the rules. Going against morality or public order. Propagating defamatory expressions toward certain persons or groups. Mimicking or copying of someone else's work. Infringing on a third-party's copyright. Being inappropriate and not consistent with the purpose of this competition. Using copied and counterfeit products, which are prohibited. The entry of a work which encroach or may encroach upon any third party's portrait rights, intellectual property rights such as copyright and any other rights are prohibited. (i.e. : No company logos, trademarks, or product lettering (etc.) may be used unless prior permission has been obtained from the rights holder). The entrant will be fully responsible for its settlement as well as any cost that may occur in the case of any disputes resulting from the submitted models. The entrants are also responsible for compensation of any damages to BANDAI and/or the Third Parties. You may be disqualified from the World Championship if the work has been significantly altered or modified after winning the Web entry or the national competition. BANDAI reserves all the rights to its decision. Any advertising using the name of [GBWC] is not allowed. - To any winner who breaks the rules and regulations of the contest, the organizer has the right to proceed to a disqualification and collect all prizes that were rewarded. - The organizer will contact the contestant directly if an investigation is required. - If the contestant cannot be reached, the work will be forfeited. - During the investigation, contestants are required to send photos for more reference. - If the contestant is unable to provide the photos, the work will be forfeited. - Contestants that use any copyrighted background/character that will damage a3rd party’s brand may not be able to join the contest and will be asked to remove the content. - Contestants may need to seek for approval if they’re using any 3rd party’s background that they purchased online or found from any search engines. - Contestants are allowed to use work submitted in a previous contest, but they may need to seek approval from its contest organizer. The work will be returned to you 12 to 18 months after the competition to allow evaluation by a jury, event display and photo shoots. Winning works may be asked to be displayed at future events, etc. BANDAI will not bear any responsibility for any damage or loss occurring during shipping. The organizer will be extremely careful while handling your work, but we cannot fully guarantee its safety. - By entering, contestants agree to BANDAI and others companies who are appointed by BANDAI (us) to use submitted works (photograph, title, comments, winning models' images taken by the organizer, images which were sent to the organizer for the final judging and actual winning pieces) for the purposes listed below. - Contestants allow the organizer to alter their images by adjusting colors, cropping, correcting typographical errors in comments and title, editing comments, etc. for the purposes listed above. - The organizer will be extremely careful while handling your work, but we cannot fully guarantee its original condition upon return. - By entering the competition, entrants let BANDAI use their personal information for the reasons listed below. - We will not share a contestant's private information with third parties without the entrants' agreement, except under conditions that are necessary to fulfill legal obligations and to use for publications and other usages that are listed on the official rules. - Please follow the instructions to submit an entry via the HobbySite page. - Please upload three images of your model via Website entry form. All the images must follow the criterias listed below. Image 1 (front view): Front facing image of the model. Image 2 (back view): Back facing image of the model. Image 3 (supplementary picture): Selling point of the model. - All images must be 2MB or smaller and in JPEG format. - Please make sure that the images are of good quality. Entries with low quality images may be disqualified. - Contestants are fully responsible for any cost for internet access and data fees used to submit their entry.